Use this coupon code today to save 20% off your order of $50+ from eManualonline. 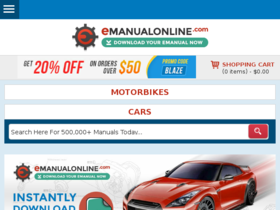 Buy 1, get the 2nd 50% off with this coupon offer from eManual online. Act now and save up to 50% off select manuals from eManualOnline. Check out eManual online for their latest special offers.